Hey lovely ladies and gents! So on my travels in Devon I saw a Superdrug with signs stating special offers!! So I dragged my man along and he got me these lovely items! Will review them for you all when I start using them. 1. 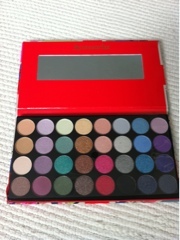 Accessorize "You are everything" palette with 32 eyeshadows! I fell in love with the packaging, union jack, butterflies and flowers adorn the front! £5.99. 2. 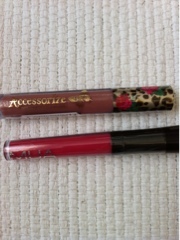 Accessorize lipgloss in "Allure". Yet again I love the packaging! Cant wait to try this! £2.99. 3. Barry M nailvarnish! Pink silver glitter. £2.99! As always I love Barry M and this colour caught my eye. 4. Barry M Instant nail effects Gold Foil Effect. £3.99. 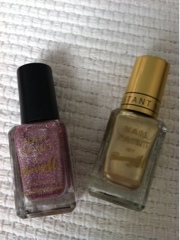 I really like metallics and hope this gold nailvarnish gives me a metallic gold look to my nails! Fingers crossed! 5. Mua eyeshadow in Pearl. I am so excited! I have never tried Mua and have heard so much about them! The price is amazing! £1!!!!! 6. Mua lipgloss in shade 3. Yet again only £1!! Gorgeous bright pink shade! Hope its good. 7. 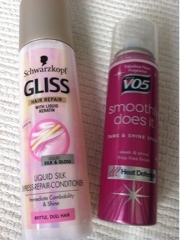 Schwarzkopf Gliss liquid silk express repair conditioner. I am desperate to tame my frizz, never used to be a problem but everythi g has changed since pregnancy! This was on offer for £0.99!! So grabbed the last bottle! 8. V05 Smoothly does it tame and shine spray. Seen the adverts and thought I would give this a go, on offer for £3.00. Will review these as I go along using them. 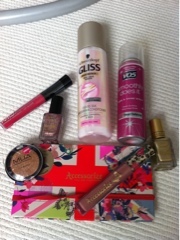 The accessorize palette looks gorgeous! How's the pigmentation? ooo the palette looks really nice.